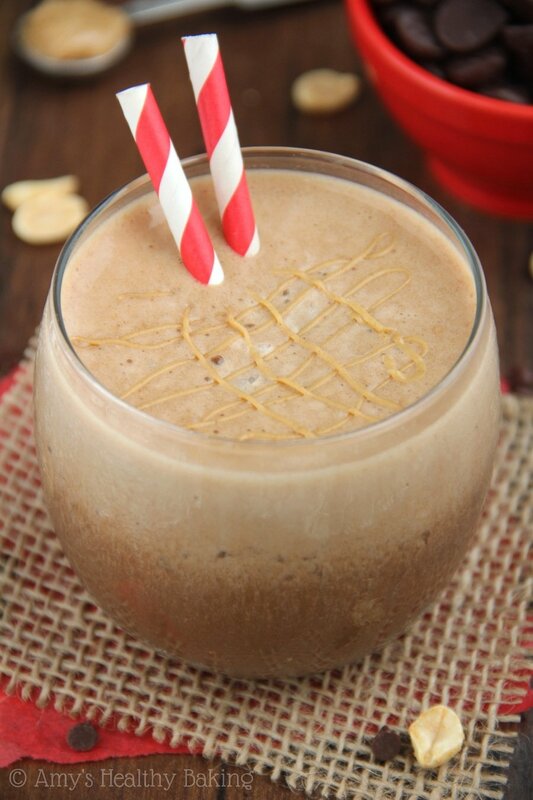 A sweet guilt-free frappuccino that tastes like a Reese’s peanut butter cup! 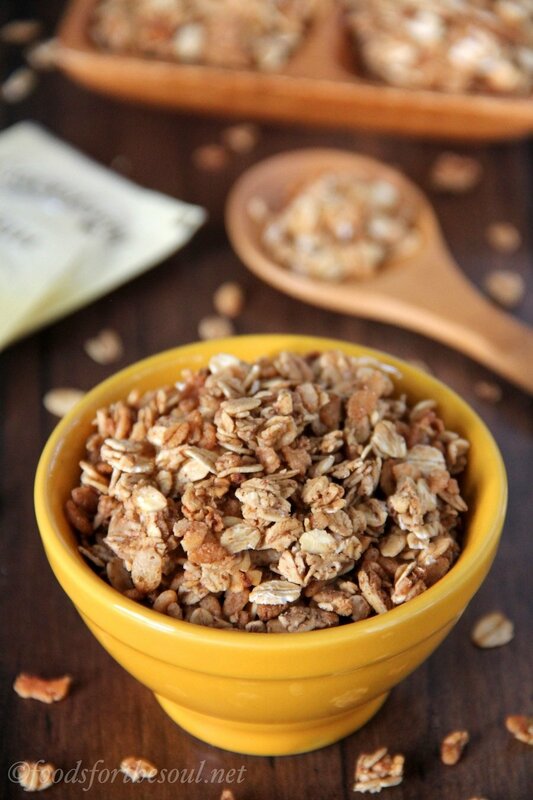 With this much flavor, you’ll never believe it’s lightened up & skinny! With Mom away on travel this past weekend and my guy arranging plans with his old college buddies, Dad and I decided it was time for another baseball game. Just like tradition, we headed out mid-morning on Saturday, arriving at the stadium 2 hours early to watch batting practice, but ended up missing the entire session while waiting in the mile-long line snaking around the parking lot. Apparently everyone in all of Northern California wanted to get their hands on the promotional freebie: a Josh Donaldson bobblehead kneeling on a tarp. Yes, a tarp… The Oakland A’s third baseman made an incredible catch in foul territory diving over the huge tarp roll last season, making this the most iconic bobblehead in baseball! Eventually, we passed through the turnstiles, accepted our memorabilia, and wove our way through the throngs inside to our season ticket seats. After settling in and slathering on sunscreen, we stayed in that same small patch of real estate for the next 5 hours. Our Athletics looked a little lackluster compared to their explosive blowout the night before, giving up a run in 3 consecutive innings to one of the worst teams in the league while only scoring 1 of their own. By the time the 9th inning rolled around, we were almost sunburned, somewhat downtrodden, and quickly losing hope. But the A’s shortstop started off the bottom of the frame by smashing a pitch over the right field wall, which breathed new life into the entire stadium. After hollering for his home run, we never sat back down, jumping and cheering like crazy people for the next few batters. Our boys patiently surprised us with a walk, a single, another single, and one last walk-off single to drive in 3 runs and win 4-3. Hooray! Dad and I rode an adrenalin high all the way home. We ignored the post-game wrap on the radio, recounting our favorite parts of the afternoon instead. But by the time we pulled into the driveway, that excited energy wore off, leaving me sun-soaked, tired, and in desperate need of caffeine. I still needed to drive almost 2 hours back to my own house! 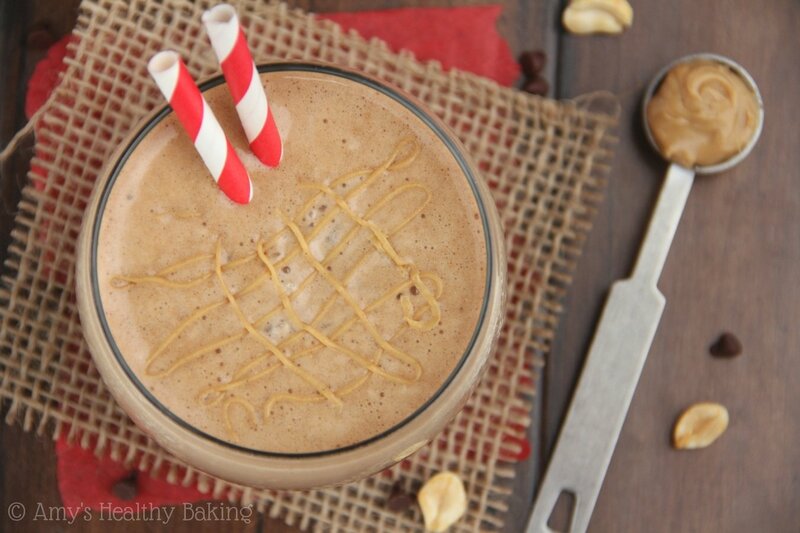 A Skinny Chocolate Peanut Butter Frappuccino! Packed with flavor but very few calories, this icy drink hits the spot without making you feel heavy or bloated. 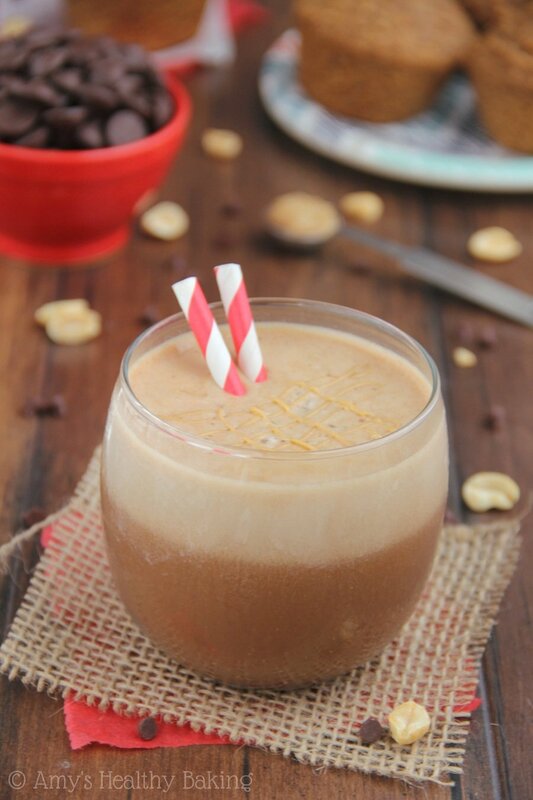 Made with only wholesome clean-eating ingredients, this sweet frappuccino still tastes chocolaty and almost candy-like—just like a Reese’s peanut butter cup! 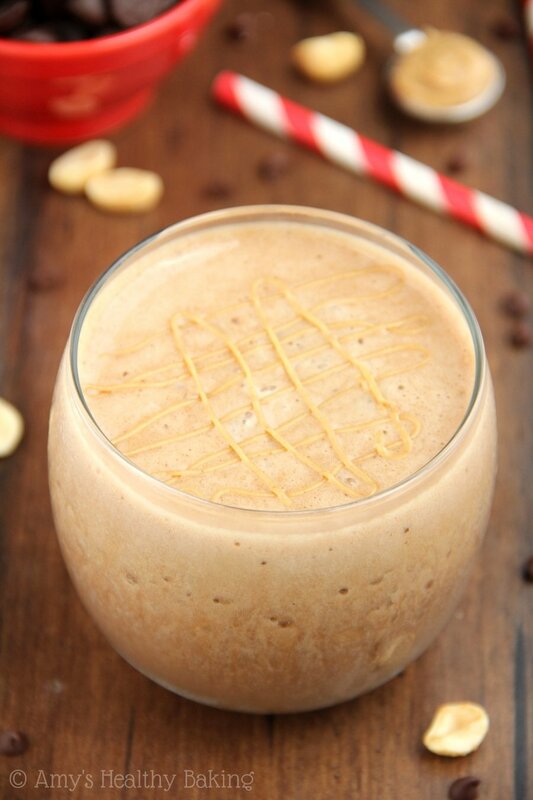 To lighten up the frapp, I used PB2 instead of regular peanut butter. PB2 is powdered peanut butter and contains about a quarter of the fat and calories. Many grocery stores have started stocking it, as well as Walmart. It’s on the same shelves as regular peanut butter, but PB2 is currently sold in slightly taller and skinnier jars. Similar to regular flour, it’ll keep for months while stored at room temperature. For my frappuccinos, I prefer to thoroughly blend the wet and dry ingredients first. 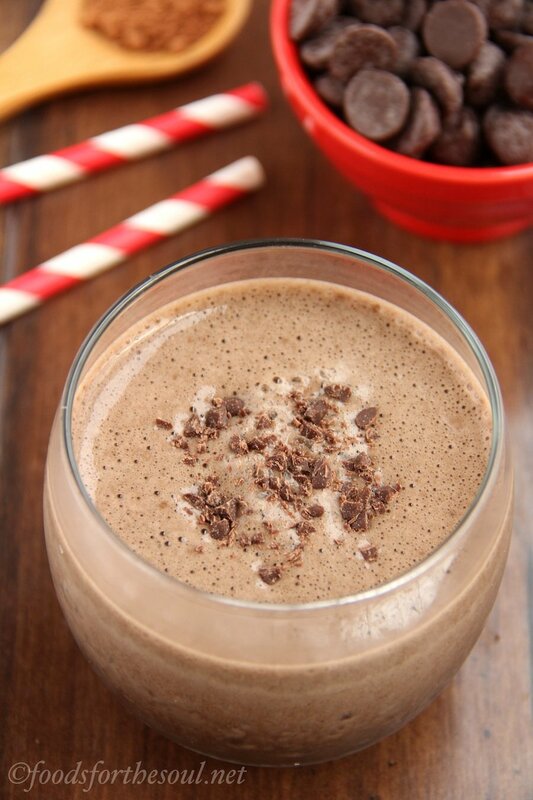 Cocoa powder tends to clump, so blending it with the coffee and milk beforehand helps reduce that. Then add in the ice and pulse until smooth. Don’t forget the best part: the creamy peanut butter drizzle on top! There’s a secret to making thick frappuccinos that don’t separate as quickly: xanthan gum! 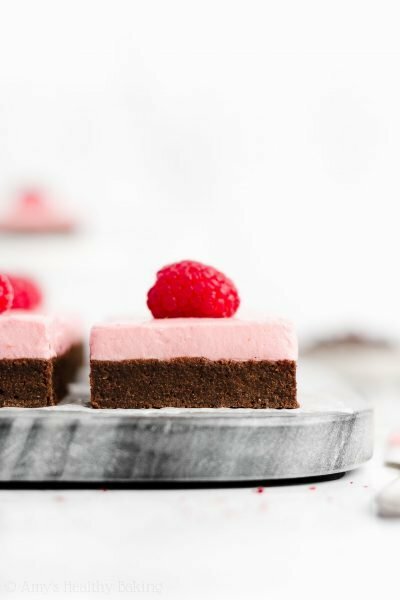 Typically used to help thicken gluten-free baked goodies and imitate gluten’s stretchy properties, just 1/16 of a teaspoon of xanthan gum will help prevent separating—but not eliminate it entirely. So try not to take an hour to slurp up your drink! 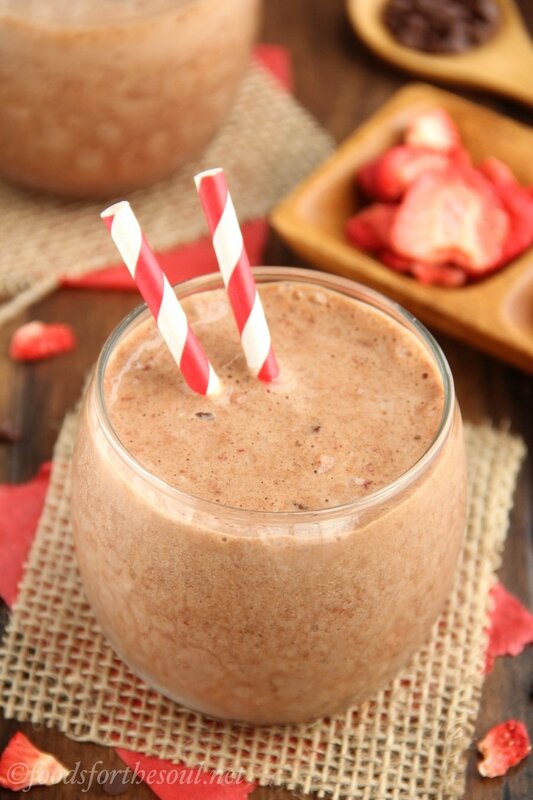 It’s really easy to customize this healthy frappuccino. 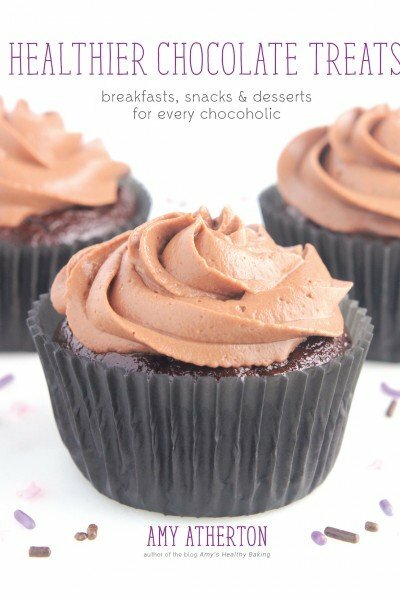 Prefer a stronger chocolate taste? Add a little more cocoa powder. 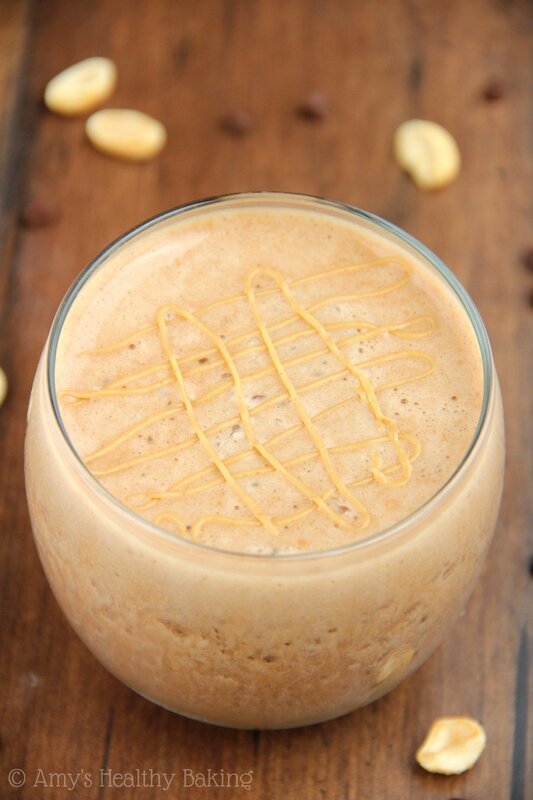 Want a more prominent peanut butter flavor? Mix in extra PB2 (or drizzle more creamy peanut butter on top!). Late in the afternoon and not looking for the caffeine? Switch to decaf instead. 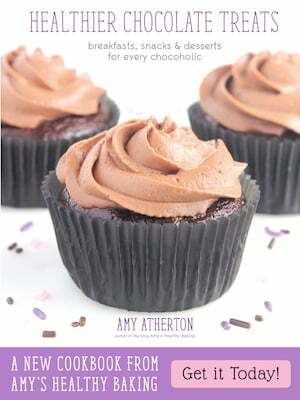 Adjust the sweetness levels to fit your tastes so you’ll have the perfect drink! After the first sip of my Skinny Chocolate Peanut Butter Frappuccino, I immediately felt like I was drinking a Reese’s peanut butter cup! The rich chocolate taste, the sweet peanutty flavor, and that creamy drizzle on top… Basically heaven in a glass—for just 95 calories! 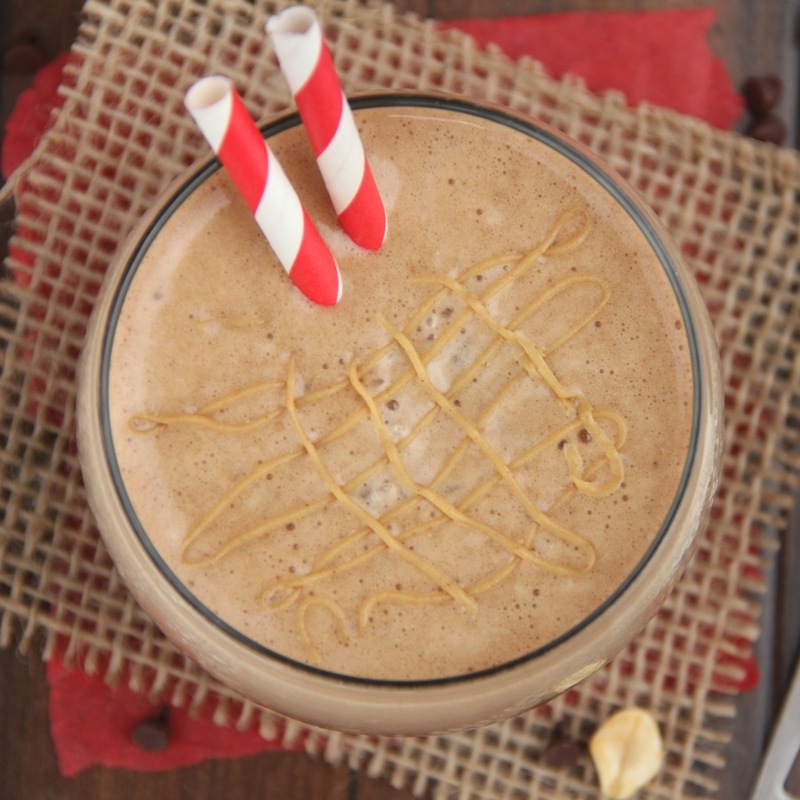 This refreshing frappuccino tastes just like a Reese’s peanut butter cup! 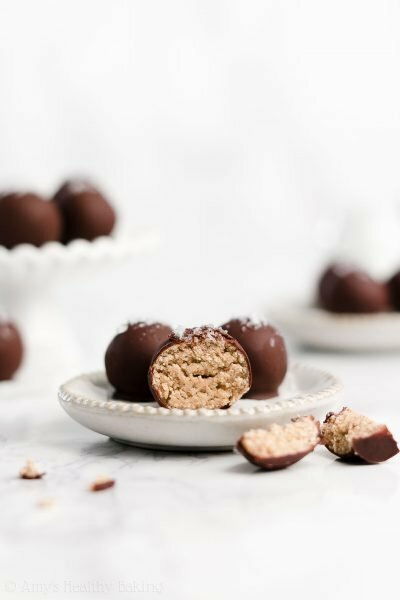 The rich chocolate taste and sweet peanut butter flavor is a match made in heaven. 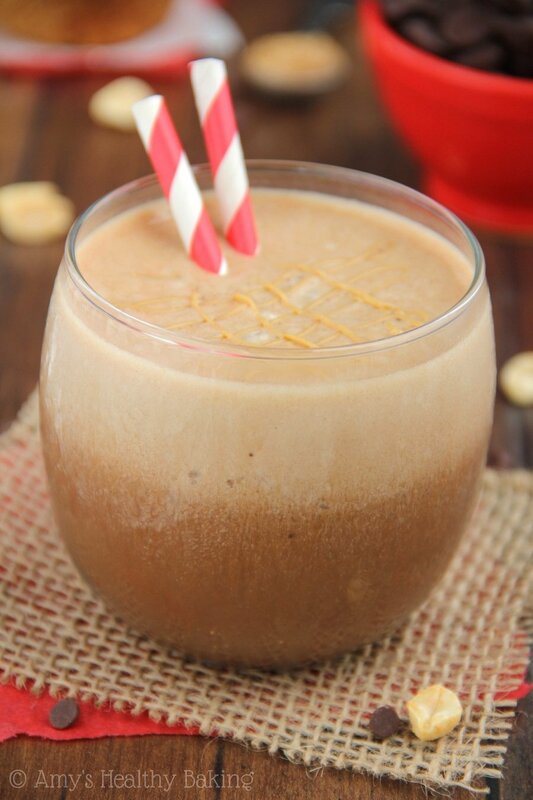 Save money (and calories) spent at coffee shops by making your own blended drink at home! 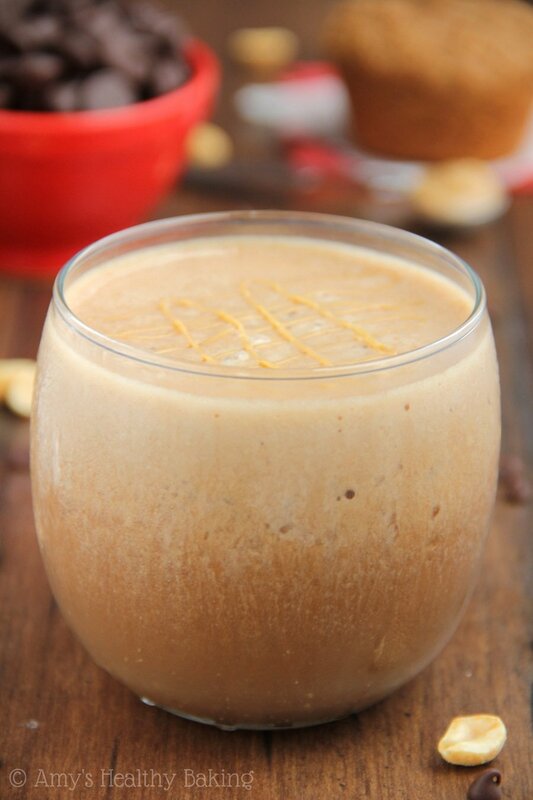 Add coffee, milk, cocoa powder, and powdered peanut butter to a blender. Pulse until well combined, scraping down the sides as necessary. Add the ice and sweetener (if using). Blend until smooth and no large ice chunks remain. Pour into a glass, drizzle with the warm peanut butter, and serve immediately. Notes: To prepare the double-strength coffee, I used 2 teaspoons of instant coffee crystals mixed with ¾ cup water. 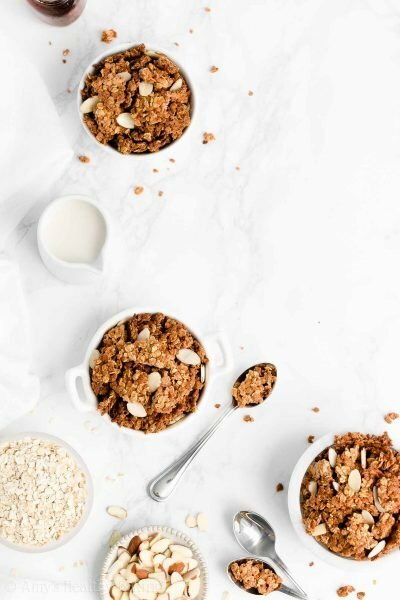 For a vegan version, substitute your favorite non-dairy milk (soy, almond, coconut, etc.). To help prevent the frappuccino from separating, add 1/16 teaspoon of xanthan gum along with the cocoa powder and powdered peanut butter. I have not tried substituting regular creamy peanut butter for the powdered peanut butter. It should work, but the calories and fat will increase significantly and the frappuccino will no longer be lightened/skinny. Followed exactly, simply made liquid cocoa-coffee water. Nothing close to a frap (in consistency). Yikes! That’s not right at all J. How cold was your coffee? Was it completely chilled, as instructed in the Ingredients list, or was it closer to room temperature or lukewarm? That would be the most likely culprit for why it melted the ice and the frappuccino didn’t turn out with the correct consistency. I am so excited to try this, and it sounds amazing. After trying the pumpkin spice latte, I know this will be fantastic. I am ordering the. Xanthium Gum today. Amy, I owe you a ton of thank yous! 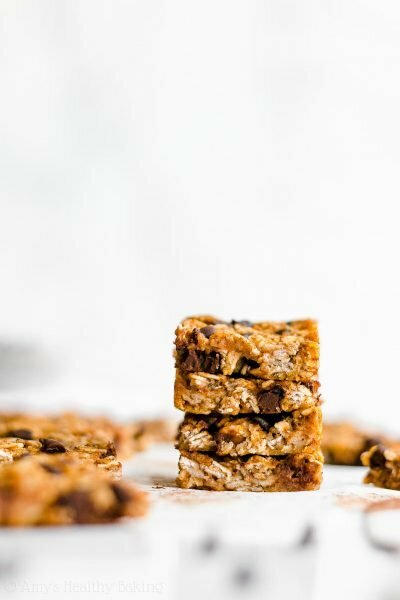 After losing 125 lbs 20 years ago, these recipes keep me on track. You are an Angel? I’m truly honored you’re enjoying my recipes Diane! That means the world to me! And WOW!!! What an inspiration you are, to lose 125 pounds and continue to stay on track! That’s incredible!!! 🙂 I can’t wait to hear what you think of this frappuccino!